To help keep users’ attention on the music, Pandora is introducing a new mobile ad platform that offers responsive mobile display and muted video. The ads launch in beta this summer with Express and the Lexus Dealer Association and will be made available to all advertisers later this year. The new formats, which appear within the square space that houses album art, offer a larger digital canvas for marketers and a less intrusive ad experience for the user, said the company in a news release today. 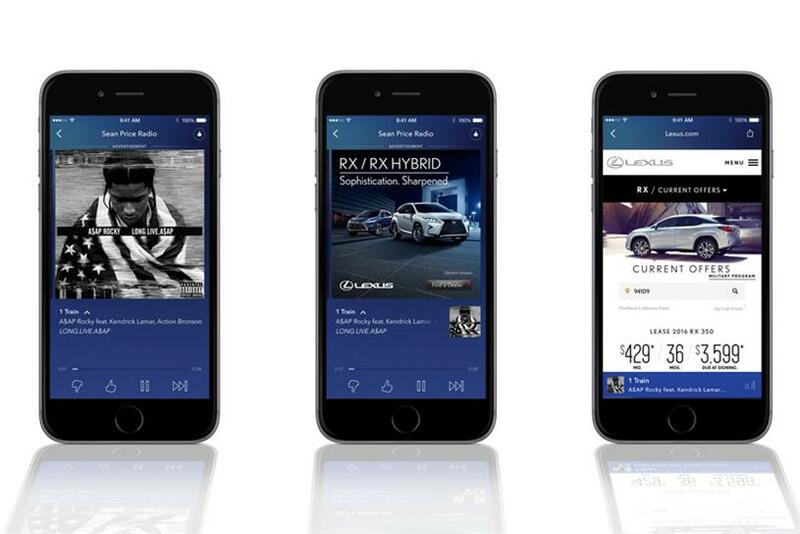 "We saw an industry-wide problem with visual mobile ads and focused on what ‘the impression’ initially set out to achieve: viewability, time spent, attention and engagement," said John Trimble, chief revenue officer at Pandora, in the news release. "We are changing the game by helping advertisers think less about traditional impressions and more about the quality of each interaction." Pandora has 80 million active users every month and 80 percent of them are on mobile. "Pandora is, at its heart, a mobile company," said Jonathan Eccles, senior product manager, in a telephone interview. The responsive display and the muted video option enhances the listener’s experience and gives them more control, while pop-up ads can distract users from their music streaming, Eccles said. Listeners will now be able to tap on the video to unmute the ad. Once the ad expands to full screen, users can elect to close it by clicking out of it. "I believe that creates a more authentic intention for advertisers," he said. Muted video keeps users attention on the music, Eccles said. "You can keep listening to your music and the ad will start playing on the screen," he said. "We’re not going to interrupt that with this new ad format." Studies show that users prefer muted video advertising when they are interacting with a website. According to an internet trends report conducted by venture capitol firm KPCB, more than 80% of video ads are muted by users. Another survey conducted by Wibbitz in May found that 45% of participants said that muted videos are the most "tolerable" form of advertising.